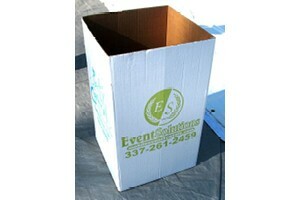 Disposable trash boxes can be the simple solution to littering at your special event. These lightweight and economical trash containers can be conveniently placed near food tents or restroom facilities where littering is most common. They will promote a litter-free environment and help keep your event clean. Your guests will appreciate the convenience and you’ll love not having to clean up the extra mess. Trash Disposal Boxes can easily be added to any portable restroom order. Each trash box includes a 45-gallon bag. Additional trash bags are available upon request.